Council of Agencies Serving South Asians (CASSA) with the support of City of Toronto proudly presents its second annual “Toronto Mela” on the 07th of September 2013 at Albert Campbell Square (located outside Scarborough Town Centre RT Station). 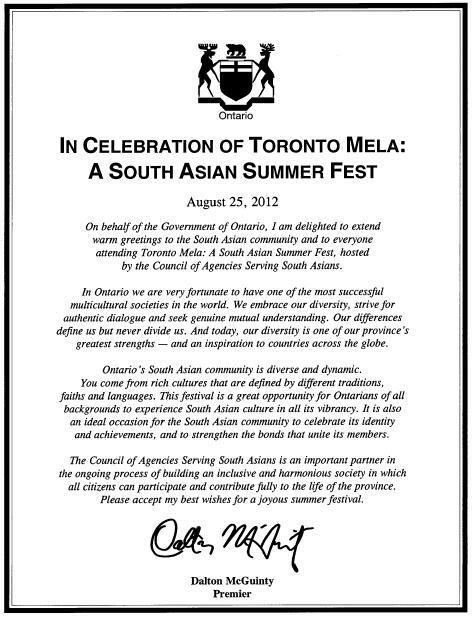 Toronto Mela 2013 is an attempt to gather South Asians communities to rejoice the cultural diversity in Toronto. This event is expected to gather thousands of residents across the GTA to celebrate a wonderful evening of South Asian cultural dance, music, performing arts, and delicious cuisine. In addition, many vendors are participating in the Toronto Mela 2013 to promote their products and services to the attendees. 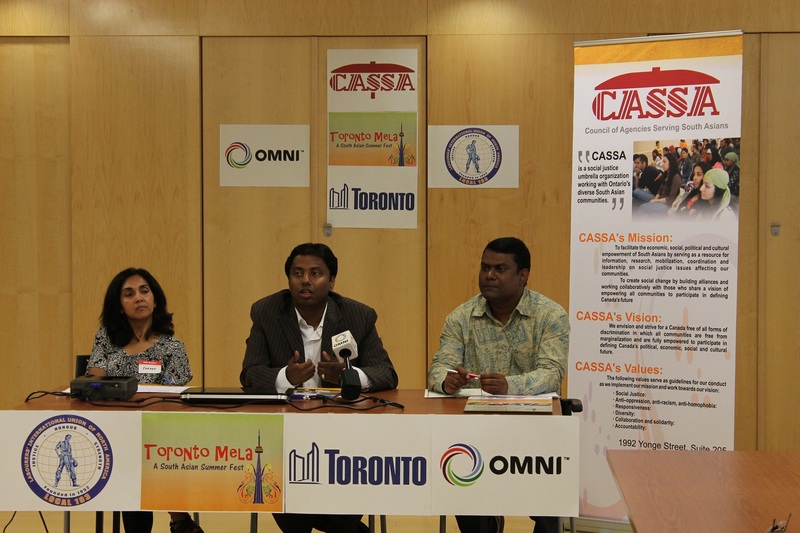 CASSA is a non-profit umbrella organization of South Asians that has been advocating for social and economic justice in Ontario since 1988. For the second time, CASSA plans to host a South Asian Summer Festival to recognize the diversity within South Asians and to celebrate our contributions to Canada. Toronto Mela 2013 will feature South Asian cultural dance, music, and other artistic performances from 4 pm to 7 pm. These hours are allocated exclusively to language and culture centric performances including Tamil, Hindi, Punjabi, Urdu, and Bengali. Following that, from 7 pm. to 9 pm, a two-hour program dedicated to diversity of the South Asian cultures. To entertain our guests, many leading artists in the GTA will be performing at the Albert Campbell Square stage. In total, over fifty performers are scheduled to provide you the unforgettable entertainment. Toronto Mela will be a family oriented event that will entertain your family through fun games and activities such as bouncing castles, basketball challenges, raffles, free giveaways, henna, face painting and delicious cuisine. Toronto Mela 2012 provided an amazing opportunity for over 50 South Asian Canadian artists to showcase their talents in vocal, dance and music performances. Leadership was promoted amongst close to 100 youth volunteers who were directly involved in various aspects of the festival. In addition, the Mela connected many service agencies to the attendees through having them exhibit information about their services at the festival. Please see details at http://torontomela.ca/eevent-news-photos/. Another unique feature of Toronto Mela is that it will provide free back to school giveaways and useful information to parents. You’ll have an opportunity to access information about your children’s education while getting free gifts from over thousands of back to school giveaways that are waiting to be distributed. More than hundred volunteers are preparing to provide you with an amazing Mela experience. 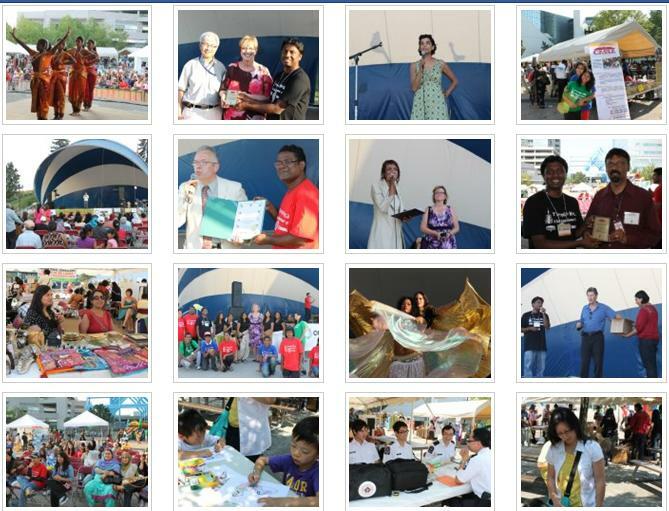 Through this Mela, we hope to increase the community’s awareness about the cultural diversity in Toronto. We hope you will join the celebrations on Aug 25th.